There’s nothing worse than a tired, old bathroom. Mankato Family Homes can help! Bathroom remodels can provide that sense of quality and even luxury that truly makes your home stand out from the rest. Bathroom remodels have the second greatest return on investment when selling your home; the first is kitchen remodeling. 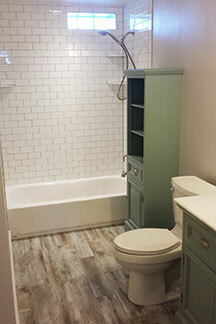 Mankato Family Homes has helped many homeowners throughout Mankato with their bathroom remodeling needs. Clients want their bathroom remodeling done on time and on budget. Mankato Family Homes works hand-in-hand with customers from the initial design process to completion. There are many things to consider when remodeling a bathroom, including layout, design, cabinets, countertops, hardware, flooring, functionality and more. Contact Mankato Family Homes, your bathroom remodeling contractor, to discuss your bathroom remodeling ideas. From small updates to full on demolition and rebuild, call Mankato Family Homes to remodel your bathroom.